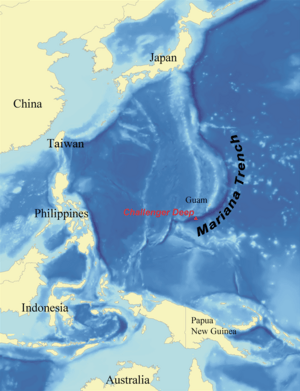 The Mariana Trench is the deepest known submarine trench. It is also the deepest known location on Earth itself. It lies south and east of the Mariana Islands, and has a depth up to 10,971 m. The western end of the trench is near Guam. The most recent (1 June 2009) sonar mapping of the Challenger Deep from the Kilo Moana, has found a spot with a depth of 10,971 m (35,994 ft) (6.82 miles). The sonar system has an accuracy of better than 0.2% of water depth (this is an error of about 22 m (72 ft) at this depth). The bathyscaphe Trieste (designed by Auguste Piccard), the first manned vehicle to reach the bottom of the Marianas Trench. 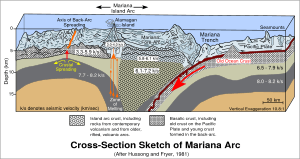 Mariana Trench Facts for Kids. Kiddle Encyclopedia.